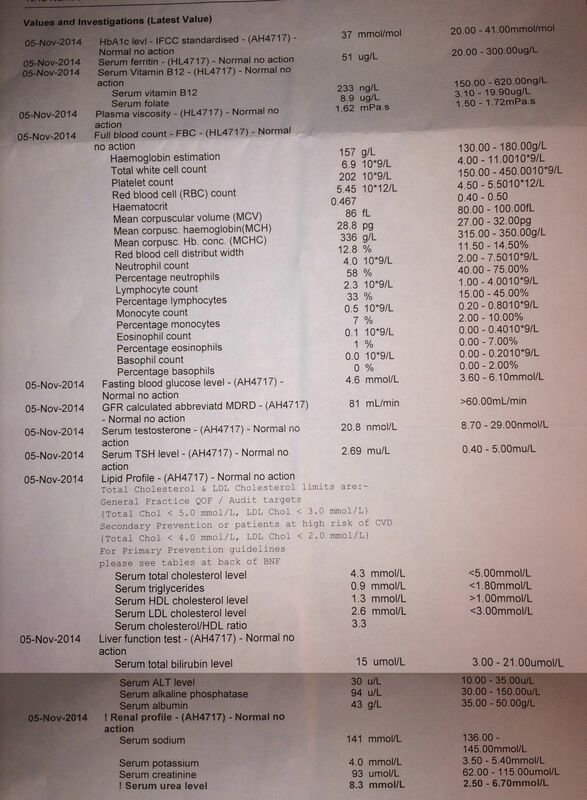 Hey, can you guys give me any indication on how good my blood levels and testosterone levels are? I'm 28 yrs old, 5'10, weigh 165lbs. Never touched steroids but have started looking into it more and more. I wanted to get my blood checked before I did anything so I have an idea what I am naturally. Can you guys shed any light or give any advise going forward based on this? All values look good and test level is very good! All I can say is I never had test levels checked before I started using aas! I have had a number of tests during periods of not using aas and have never had a test level higher 11! Now that clearly comes with its own complications. Other things to consider do you have kids, do you want kids? Yes I do want children in the very near future. If I was to place a timeline on it I'd say within the next 2 to 3 years. Will a cycle affect this? Ive been cycling since about your age. Ive been on several years without a break, following pct protacals previously i have never had a test level above 7.8 and am now having fertillity issues. You are looking good buddy naturally. My mrs is currently 6months pregnant, but this was a long road to get there! When I came off to try and get my mrs pregnant I had fertility and my sperm count was and the quality was poor! This took many months of self medication to improve as doctors when really don't help male fertility issues all they recommend is a good multi vit which generally does sod all any way! My advice would be hold off any aas use seen as you hoping to be having kids in the not too distance future! Westy19 when you say self medication ? What was your protacal after pct or was pct and time to recover sufficient ? 2 Pct's and a year was were not sufficent for my fertility. I got my test levels back with in normal range but then had fertility tests and my sperm count was low and of poor quality! Initially I started with just proviron this boosted my sperm found and quality to with in normal ranges but low end of normal! Towards the end after getting increasingly desperate I added hcg and clomid aswell which I ran for about 3-4months and was tested my sperm count was at 120million per ml and quality was vastly improved! Shortly after my mrs fell pregnant! In total from coming off to falling pregnant was 2 and a half years! Thanks buddy I'm on a 45 day pct of aromasin, clomid and nova at mo so gonna see how I end up...will keep the proviron in mind, thought it was a little suppressive though ? Can I ask, where did you get the test done? Thanks for the replies. Think I'll hold off for a few years as I do want kids in next 2-3 years with the misses and I'm no rush to use steroids as it is. I went to my GP as he's quite good and chilled out. If your GP is a bit stubborn I'd suggest googling symptons of low testestorone. In your appointment tell him you're feeling like this and done a bit of research online and believe it could be as a result of low testostorone, and you'd like a bloodtest doing for piece of mind. Don't mention steroids.